View More In Candleholders - Page 3. This four level pyramid has three levels that turn, and is made of both natural and stained wood. The nativity is on the bottom, the three kings on their way to Bethlehem are on the second level, a shepherd tending his sheep on the next up, and finally the heralding angels are on top. The three tiers rotate, while the heralding angels remain stationary. 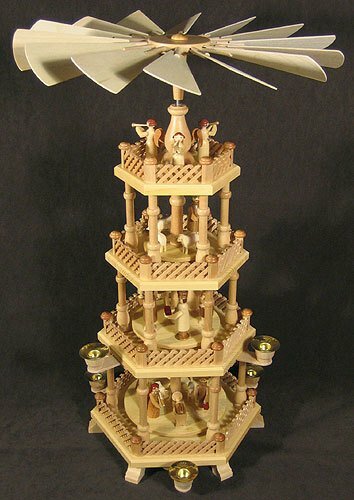 4 Level Natural Nativity Pyramid 56cm stands about 22 inches tall, and requires 6 medium. candles to turn. Made in Seiffen, Germany. Handmade by the Artisan Coop. The German Pyramid will make your holiday dreams complete while envisioning the unfolding Christmas scenes. Pack of 6 Eco Country Red Christmas Tea Light Lanterns 12" - 22"